Pakistan today successfully conducted the test fire of indigenously developed Short Range Surface to Surface Multi Tube Missile Hatf IX (NASR). NASR, with a range of 60 km, can carry nuclear warheads of appropriate yield, with high accuracy, and possesses shoot & scoot attributes. This quick response system addresses the need to deter evolving threats, specially at shorter ranges. The test was witnessed by Director General Strategic Plans Division Lieutenant General Khalid Ahmed Kidwai (R), Chairman NESCOM Mr Irfan Burney, Commander Army Strategic Forces Command, Lieutenant General Tariq Nadeem Gilani, Senior Officers from the Strategic forces and scientists and engineers of strategic organizations. 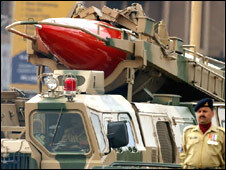 The Director General Strategic Plans Division, Lieutenant General Khalid Ahmed Kidwai (R), terming the NASR Missile as a weapon of peace, said that the test was a major development which will consolidate Pakistan’s deterrence capability at all levels of the threat spectrum, thereby ensuring peace in the region. The successful test has also been warmly appreciated by the President, Prime Minister of Pakistan and Chairman Joint Chiefs of Staff Committee, who have congratulated the scientists and engineers on their outstanding success. This entry was posted in Uncategorized and tagged Gen Kidwai, Hatf IX (NASR), ISPR, Missile, NESCOM, Pak Army, Pakistan, Pakistan Army, SPD. Bookmark the permalink.